Costa Rica Vacations. Costa Rica Last Minute Travel Deals. What could be better than packing up your bags on the spur of the moment and heading to beautiful Costa Rica? It’s great when the opportunity presents itself, but not so great when you find out that many travel agencies and airlines charge high prices when you book last minute. We know how important it is to be able to just get up and go, and not have to spend a fortune to do it; and that’s why we have tons of options for a Costa Rica vacation, including Cost Rica all-inclusive vacations and unbeatable Costa Rica last minute deals. We always have tons of last minute deals to Costa Rica, and at some of the lowest prices too! One of our packages, the Flamingo Beach Resort, is one of the most beautiful locations in Costa Rica, and we’re proud to offer it for just over a thousand dollars! This is just one of our idealistic Costa Rica vacations, and we’re always adding more so be sure to keep checking back, for when it’s your time to just get up and go. 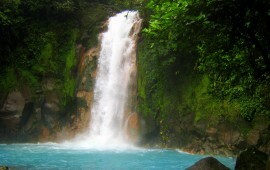 We also have sent many happy clients away on Costa Rica vacations. This destination is wonderful for both honeymooners who want to take in breathtaking scenery, and those who just want to get out and explore Manuel Antonio National Park. And, not only will we set you up in a beautiful spot, but we’ll make sure that your travel plans and arrangements are seamless from the moment you call us, to the time you arrive at your luxury Costa Rican hotel! Just listen to what Lou Ann had to say about her trip to Costa Rica. There’s nothing we love better than hearing back from happy travelers, and knowing that when opportunity knocked, we were the answer – and we love helping so many people realize their dream vacation! Start thinking about your dream vacation, and realizing just how close within your reach it is! Fill out our online form and choose what kind of package you’re most interested in. Here you’ll find some of our best Costa Rica vacations, and many of them last minute deals too! Before you know it, you’ll be headed to one of the top travel destinations in the world!